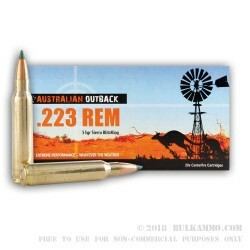 These 223 Rem caliber cartridges by Australian Defense Industries feature 55 grain bullets tipped in Sierra's BlitzKing polymer. That polymer was specifically designed to convey high accuracy along with devastating expansion when its bullet hits a small target. The lightweight bullet also has a 3,264 fps muzzle velocity, and maintains a consistently flat trajectory as well. The combined effect of all of this is a bullet optimized for reliably exploding varmints, in addition to range and match shooting. As it is manufactured in Australia, this cartridge is designed to perform reliably in the country’s extremely high and low temperatures. Its proprietary Ballistic Temperature Independence technology ensures it will always deliver a consistently high velocity, a feature of great value in the United States’ varied climes as well. Australian Defense Industries produced military ammunition for their country’s army in both world wars, and places the utmost value on attention to detail. This round is just one shining example of that principle.